There’s a little room at the top of the steps that I’ve never shown you. If you’ve been following for a while, you probably already know that I take care of two of my granddaughters during the day. Miss M is almost nine and Miss K is three. I started taking care of Miss M during the day when she was three. It didn’t take me long at all to realize that a place to play was sorely needed! Um…yeah. There are quite a few upcycled Goodwill pieces in here and a couple of diy projects. I put this room together before I started blogging so I’ll just have to try to explain to you what I did. Come on in so I can show you around. Any of you familiar with Ikea will recognize the two cubbie units and plastic bins. These pieces are great for storing all those little pieces of toys that seem to multiply like rabbits. The white table and dry erase/magnet board were GW finds that I painted. The little white chairs came from Ikea and the wall pocket was a clearance score from HomeGoods. If you’re wondering what that is in the clear jar, it’s pieces of uncooked pasta. The girls love to use them in their art projects. Speaking of art, we have to have a place to proudly display their creations – right? This was such an easy project. 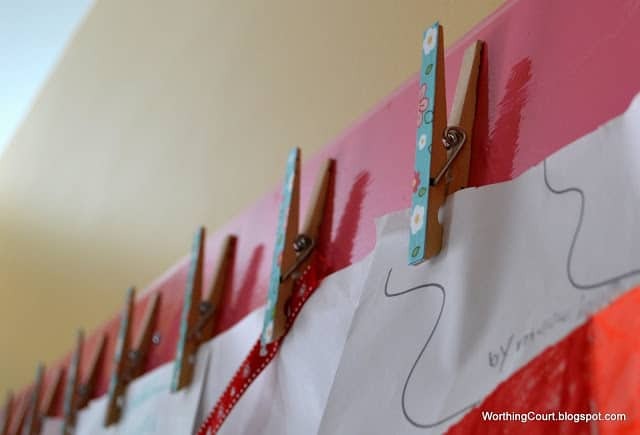 I painted a piece of leftover moulding, ModPodged some scrapbook paper to clothespins and glued them to wood. There is an unlimited (so the girls think) supply of paper on this roll of paper that I hung on a towel bar. The piece of art above the shelves was painted by my sweet step-daughter, Ms. B. She is one talented young lady that I’m so proud of. All I did was show her a picture I took of a couple of owl pictures that I had seen in Target and told her what colors I wanted to be in the picture.Miss B did a great job and I just love it! The cutie-patootey owl bookends came from Kirklands a few weeks ago. 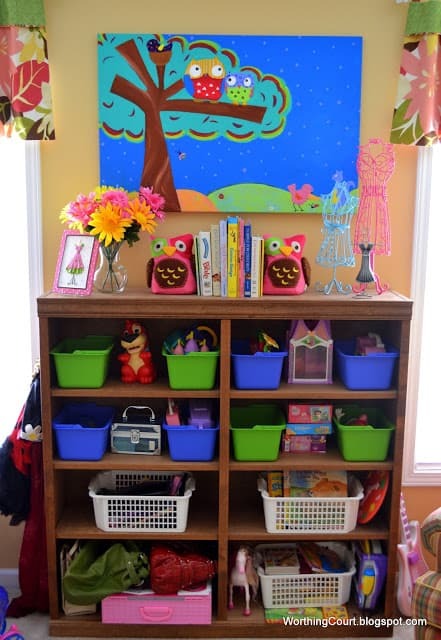 What playroom for two little girls would be complete unless it contained a dress-up space? 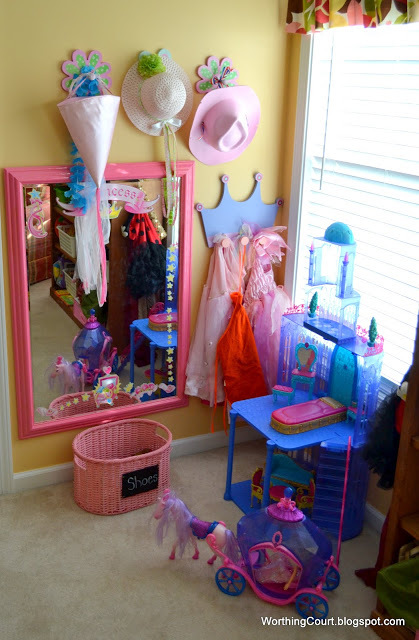 Every little princess must have a place to hang her lovely ball gowns! The curtain to left covers the closet. I took the door down because of the space that it took up whenever it was opened. The mirror was a Craigslist find that I obviously painted. 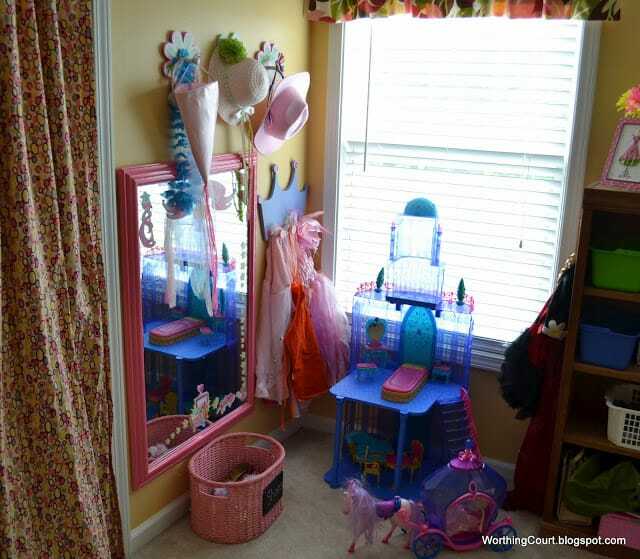 I found some princess stickers at Dollar Tree that the girls had a lot of fun applying to the mirror.The crown hanger was a GW find and the flower hangers and shoe basket were more clearance scores from HomeGoods. 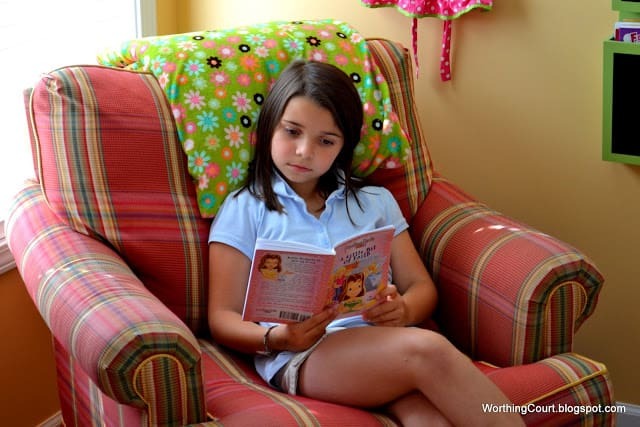 This club chair makes a great space for Miss M to curl up with a book. I love it that their mom, Ms. JB, has always encouraged reading! I’ve found that a great way to store Barbie’s, Polly Pockets and all of their accessories are these rolling stacks of drawers.They’re nothing fancy, but they sure do the trick! 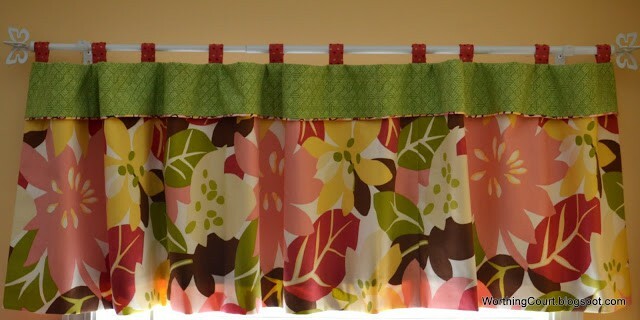 The fabric that I made the valance from became the inspiration for the colors in this room. That’s usually how I roll – the first thing I look for when decorating a room is the fabric. I combined four different fabrics for a more playful look. 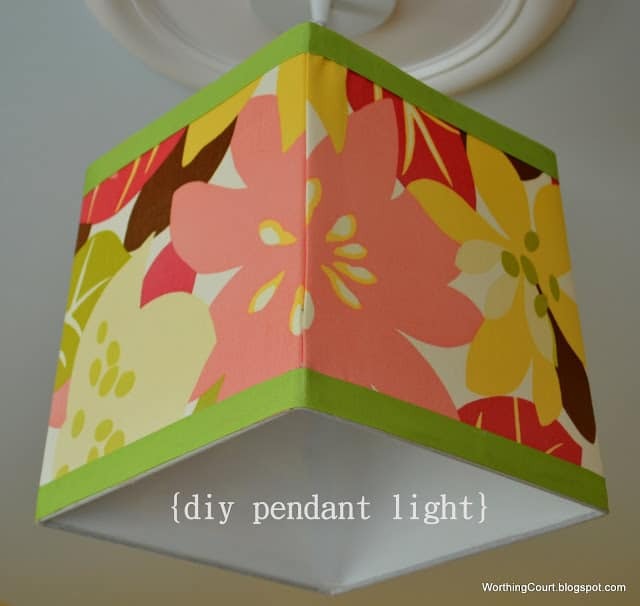 I repeated the fabric by covering a lampshade that I attached to the light pendant kit that we hung. Can you tell that the ceiling is a pale, pale blue? I love using blue on interior ceilings and found a gallon of this pretty shade for $5 in the oops section at Lowes. Another GW score was the table and chairs in the center of the room. They are originally from Cargo Kids and were a natural pine color. Out came the paint! It’s a great place to play games and do puzzles. I wanted one more way to tie the fabric into the room, so I came up with the idea of painting the design of the fabric onto the table. After the table was painted, I went back and painted a white rectangle in the center. I taped together several pieces of tracing paper and traced the outlines of the fabric pattern. I then laid the tracing paper on the white rectangle (pencil lead side down) and used a popsicle stick to rub the lines onto the white paint. We used plain old acrylic paint to fill in all of the colors. Oh – when we were finished I applied a couple of coats of sealer to protect the surface. It was a really fun project to do with Miss M! And in case you’re wondering why I haven’t shared this space with you before, it’s because on a good day it looks just like this or worse. Just keeping it real, y’all! 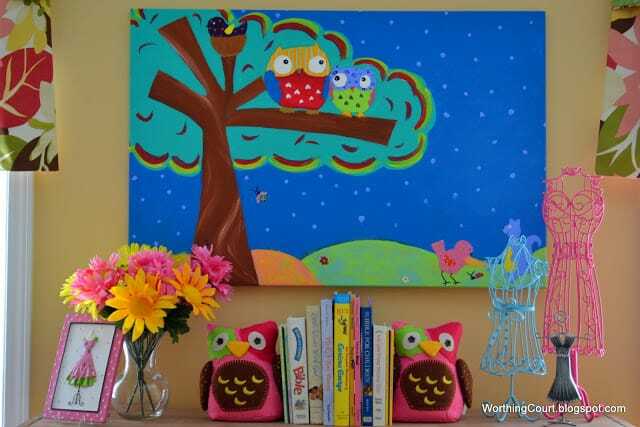 I want to be a little girl again and come play at your house – love this room and the owls are just so cute. I just love children’s spaces, and yours does not disappoint! Your granddaughters must be so thrilled to have a space all their own. Every detail is just perfect. Suzy….that room is amazing…Now I will not show my granddaughter that room…she would be so jealous!! 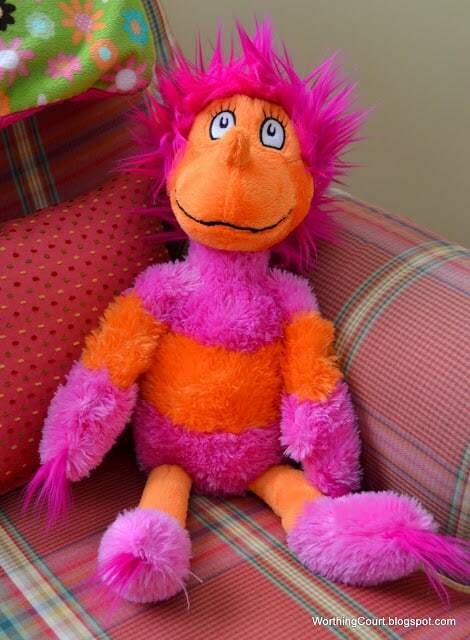 Just wish I had a “room” for her…the extra rooms for me are taken up by 2 guest rooms and my hubby’s office…so she plays in every room…Gorgeous room Suzy…love all that you did and I am sure your granddaughters love what their Grandmother has so lovingly done….Just beautiful! GREAT JOB GF!! 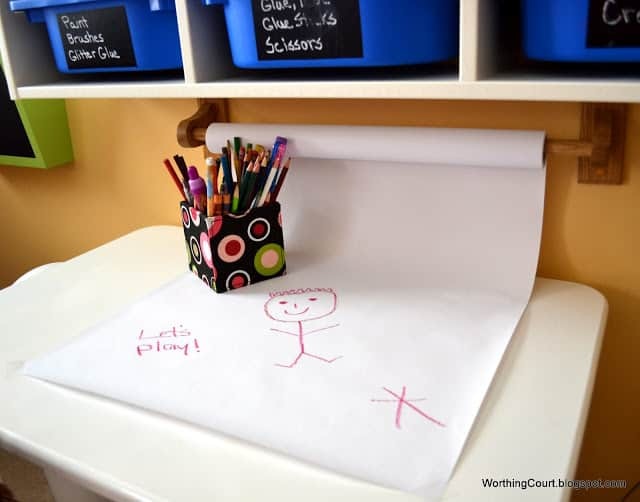 I particularly love the pendant, the green table and of course your stickman drawing ha ha! What a fun place to play!! What a fun grandma you are! Love the light, too! 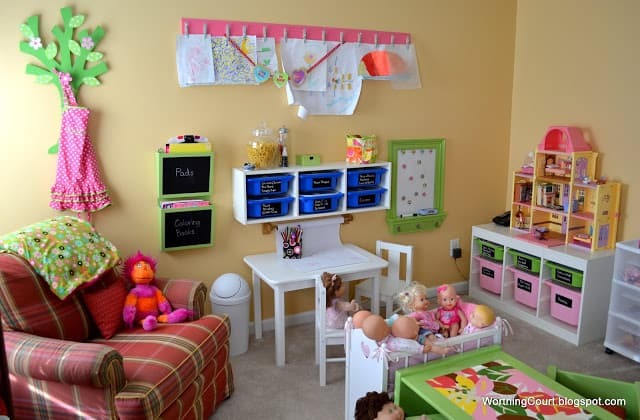 Every inch of the playroom is adorable! Suzy, This is an awesome space. It is so wonderful that you can devote such a lovely space for them. I but they are so glad to be with you all day. I can see your love for them in every element. I love that you duplicated the fabric on the table. Oh yes, I love the owl. This is such a wonderful space, Suzy, for your little granddaughters. I love the colors! It reminds me of what our family room looks like when the “Grands” are here! THat looks amazing! Can I play there? 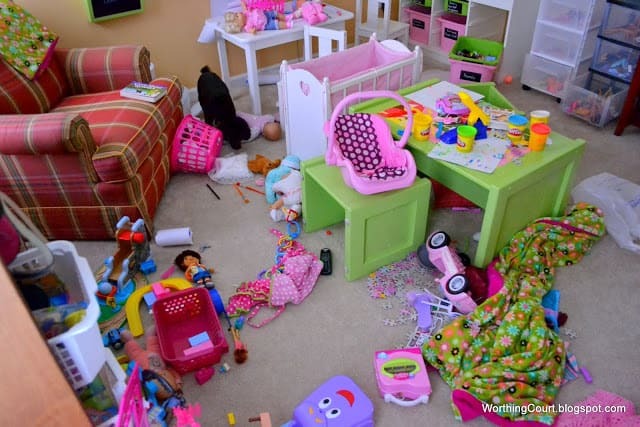 Well, I would expect it to look like that, Suzy ~ it is a PLAYroom! : ) Great job. I think you had a lot of fun putting this room together. You found some great things, too. Love the roll of paper. My granddaughter is only going to be 2 in July, but she loves to get the toddler crayons and the giant pad of drawing paper I bought for her. 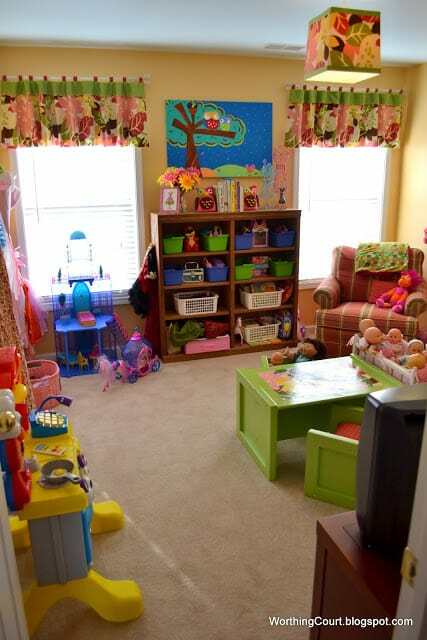 This is absolutely the cutest playroom! I love every bit of it. You did a fabulous job. Your grandkiddo’s will have happy memories of this play room forever! 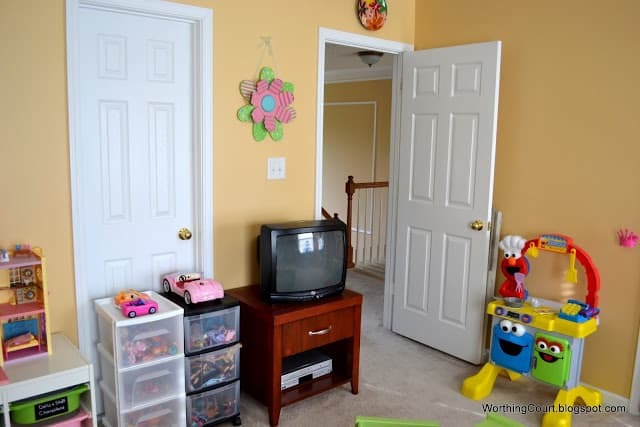 What a cheery play room! I am an owl lover 🙂 Visiting from the Cozy Home Party. That looks like any little girl’s dream room! I love those owls! Oh, I love it all. What a wonderful place for the girls to use their imaginations. 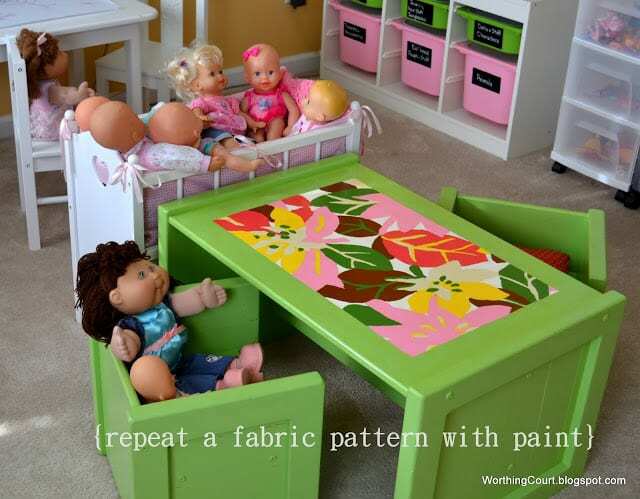 The bright colors, fun patterns, and ideas for toy storage was a real treat to see, so thanks for sharing them at Your Cozy Home Party this week! What a beautiful playroom. Well done! I love the colors and the cute owls. I just adore so much about that room, starting with “Backpack Backpack” lying on the floor. 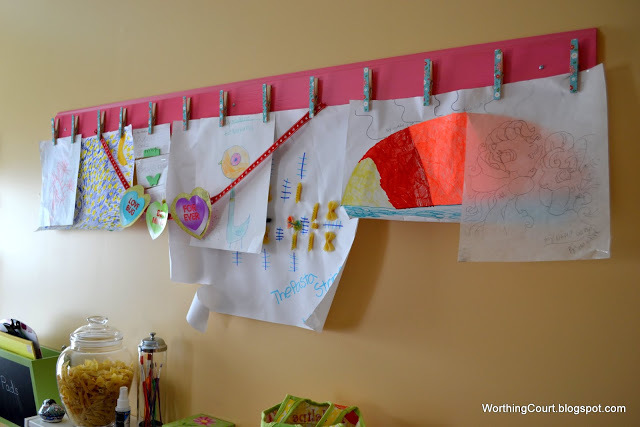 I pinned your easy peasy art display board. 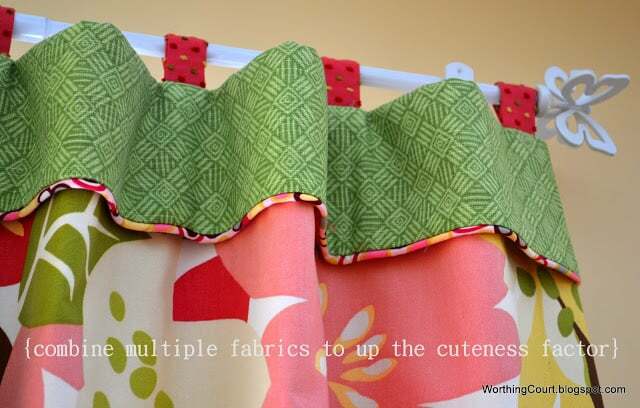 And the fabric if fabulous as are your valances and pendant light diy. But you almost killed me with that table! Oh this is just too adorable. 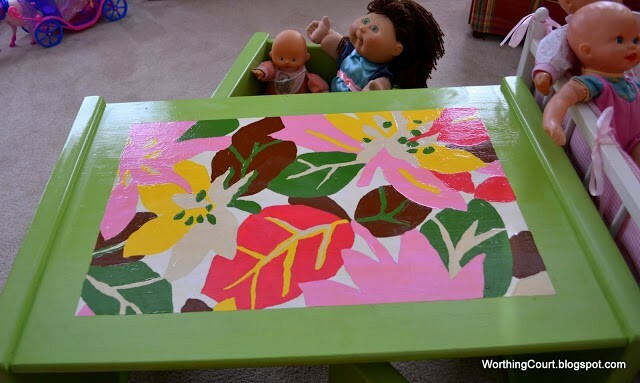 Love all the bright cheery colors and that painting she did is a masterpiece. 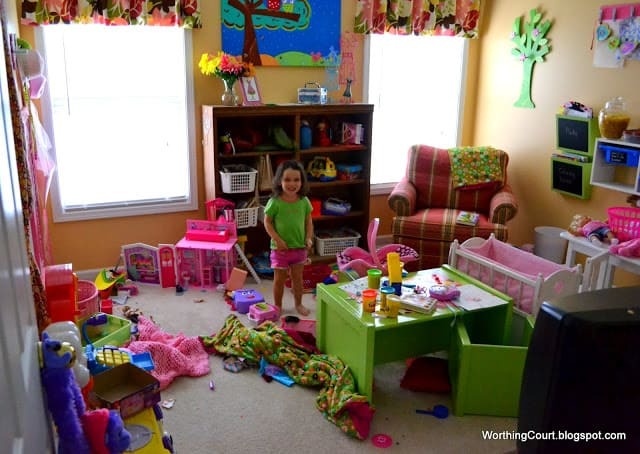 I am sure your granddaughters love this room. This is amazing! I love the paper on the towel rack. I host a weekly link party going on right now. I’d love for you to join in at http://www.thenymelrosefamily.blogspot.com. I’m a new follower. This is the cutest kids room ever! What a fantastic playroom! Your granddaughter are very lucky to have such a talented grandmother! I can’t tell you enough how perfect this is! OMG, sooo fun! 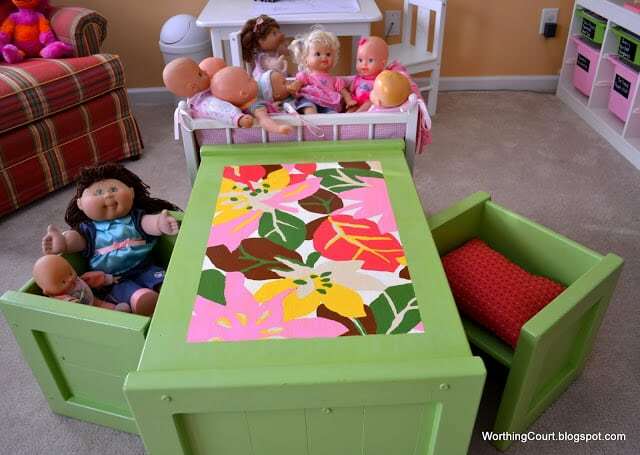 My kids are getting big and I’m already planning the grandkids’ playroom. I can’t imagine anything looking cuter than yours. What wonderful memories you are making for your sweeties! I’d love for you to add it on my link party at: http://printabelle.com/?p=3188 Thanks! What a great job you did. Not only in picking out the colors, fabrics, and such, but you did an amazing job in creating theusefulness out of every item you put into the room. I should share this with my SIL! To be a kid again -what a great space for your littles ones to spend time, create, and play. I imagine you had just as much fun creating it for them! I’ll have to snag some of these idea’s kid my little girls’ room. I’m visiting from the Uncommon Linky party. I would love if you stopped by my blog. This is so cute. I am visiting you via Wow Us Wednesdays and I hope to see you at My Dream Canvas. What a sweet fun room! What a wonderful playroom, the colors and all the special touches are super. This is a place where special memories are made I am sure. Wonderful job, thanks for sharing!! Charming and perfect—a room to delight a little girl’s heart. Imagine the conversations and the confidences and the secrets and perhaps art and music and books. I love the idea of a play space. You have put a LOT of work in and incorporated lots of great ideas. I never would have thought of a blue ceiling – but it’s a really pretty colour, and offsets the light shade beautifully. What a wonderful kid’s place space! 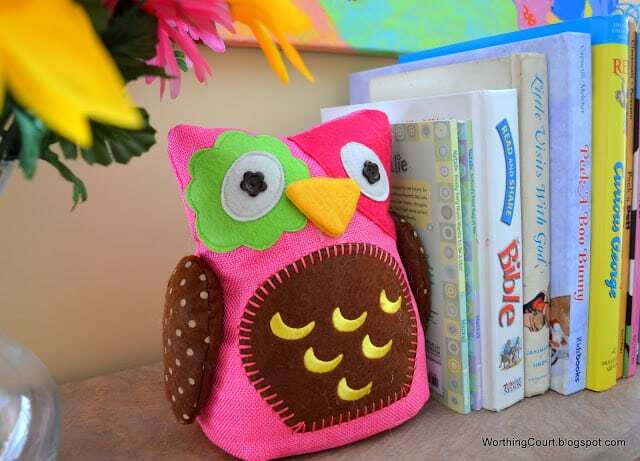 You’re little owl book end is too cute! Thanks for sharing on Weekly Top Shot! 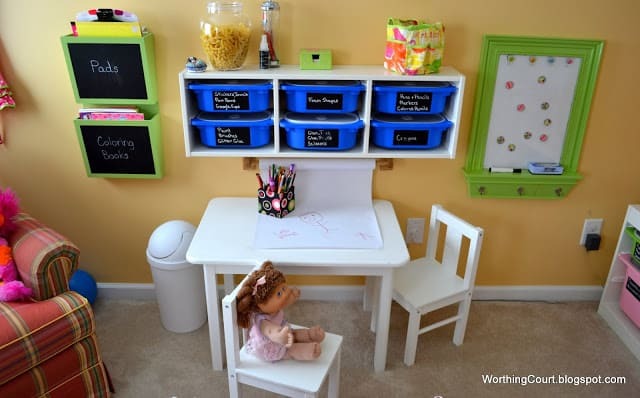 This is amazing, you have totally inspired me to add some things to my kids’ playroom!! Beautiful pictures. Perfect playground. Have a nice week. Greetings from Romania. Gorgeous room! Your granddaughters are soooo lucky!!! What an incredible room for those girls!! They must think you are the coolest ever!! 🙂 Featuring this over at our facebook page today! Thanks for linking up! Suzy, I hung on every word like I was reading a best seller! What clever ideas and such a FABULOUS STUNNING play room for those precious granddaughters! I love the thrifty way you gave everything a designer look! Your little ones must love getting lost in the land of make-believe in Grandmom’ house!! This is just perfect! Love all the bright, cheerful colors, especially the fabric on that cushy chair. Your grandchildren must LOVE coming to your house! This is fabulous!! I love the colors. What lucky grandchildren you have. I am a Granny too, and I have to say that this is MY kind of room! I love the colour, the fun and the vibrancy! Your granddaughters are very lucky indeed. This is exactly how my children’s rooms were back in the days before everything was styled. Fun. Beautiful. Functional and a reflection of the kids. Fabulous! Way cute. Sure wish I was a little girl again! Love everything in here..those curtains are great! I just found your blog today and have been here all day during my spare moments. The playroom spoke to me – I’m a Grammy to two little boys (2yo & 4yo), and I do have a playroom for them. Of course, ours is trucks, dinosaurs, a pounding bench, and super hero capes for dress-up, but I love your little girls’ room!